Since I posted my meal plan earlier this week there has been a lot of excitement about the Peanut Soup we had for dinner on Wednesday. 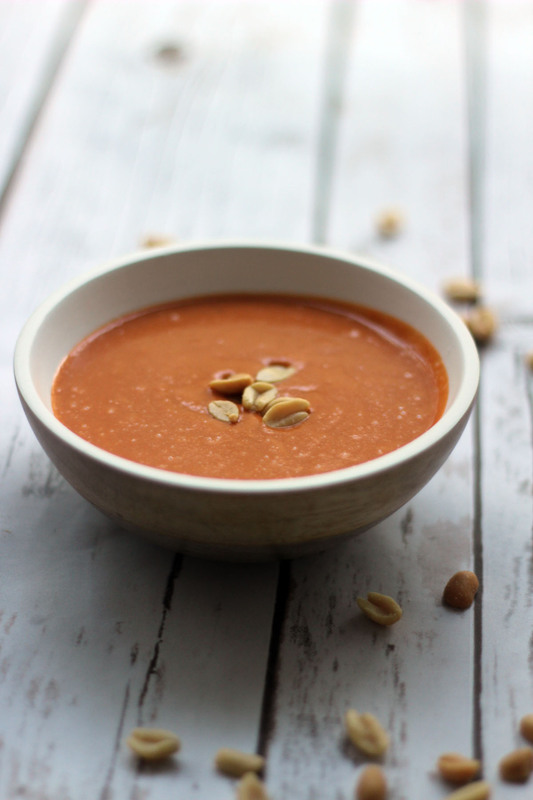 I first came across a recipe for Peanut Soup in the cook book “How to be a better cook” by Lorraine Pascale, which some of you will remember I reviewed and gave away to one lucky reader back in October last year. Lorraine’s recipe for peanut soup shots to be served cold or warm as appetisers or canapés at a dinner party really inspired me. The flavours sounded delicious but the thought of serving small quantities in silly shot glasses just didn’t appeal to me. So I took to developing my own peanut soup which could be served piping hot at the start of a meal, or indeed be served as a main course all by itself. The recipe for Peanut Soup that you see here is the result! Having done some research about the origins of Peanut Soup and how to make my dish truly authentic, I came across a stumbling block. It would seem quite different variations are served across Africa (with Ghana having a very specific recipe, eaten with fufu, a dough made from boiled and ground plantain or cassava), East Asia (or more specifically Taiwan) as well as in the state of Virginia in the United States (among others). When you look at the history of the humble peanut this kind of makes sense… As far as we know, the peanut originated in South America. Grown in Peru, Brazil then Mexico, Spanish explorers discovered the legume and not only took it back home but spread it across Asia and Africa. Africans were the first people to take the peanut to North America and eventually Virginia became the first state to grow the peanut in the US. On this side of the pond, peanuts are probably more often than not eaten in the form of peanut butter. I don’t know where they’ve got their stats from but the journo’s at the Guardian reckon that peanut butter is third in the list of best-selling spreads (just behind honey and jam). I’ve never been a huge fan of the stuff myself but we always have a jar lurking in a cupboard somewhere which is pretty lucky considering this recipe uses a four (very generously heaped) tablespoons of the stuff. Peanut butter may not be the most authentic of ingredients and whilst this recipe does blitz the mix up in the blender, I’m too lazy to wait the extra 5 or so minutes it would take to blitz up peanuts in their raw state first. If you do want to go the extra mile then you can find my home-made peanut butter recipe here. For those of you who are a little lazy like me – just stick to whatever you’ve got in the cupboard, it doesn’t have to be fancy. Fry the red onion, chillies and ginger in a pan until the onion become translucent. Stir in the peanut butter, lime juice and chopped tomatoes stirring until the wet ingredients combine to make a thick sauce. Slowly and the vegetable stock, again stirring until combined. Cook on a medium heat for 5 minutes, or, until the sauce has begun to thicken. Allow to cool for 5-10 minutes before transferring to a blender. Blitz the mix until it form a smooth soupy consistency. Transfer back into a pan and heat until just at simmering point. Cook for 5 minutes or until you've reached your desired consistency. Serve with a handful of salted peanuts, a drizzle of coconut milk and a few springs of coriander should you choose. I’ve said it before and I’ll say it again, soup really has been a key to weight loss for me. I don’t believe in meal replacement shakes and other “diet soups” you can buy as part of low calorie diet plans but I think a bowl of soup in the evening post-exercise is a quick and easy way of getting a healthy dinner that tastes good and fills you up. Roasted Garlic, Shallot and Potato Soup. I’ve also got another soup recipe which I will be posting over the next few weeks – it’s inspired by the flavours of Mexico so watch this space! 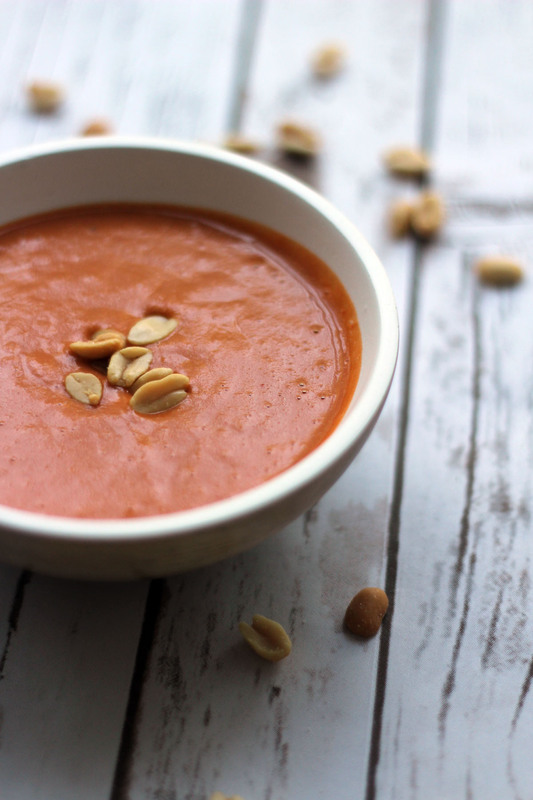 Until then, I hope you enjoy my simple recipe for Peanut Soup! I’m entering this super soup recipe into the Super Soup link up over at Jo’s Kitchen. 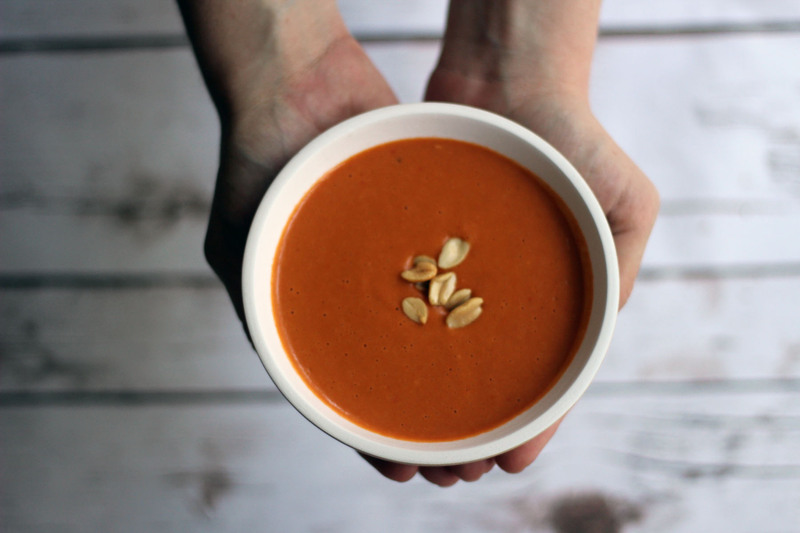 Click the badge to find more delicious soup recipes including my Quick and Easy Peanut Soup. Wow, I’ve never heard of peanut soup, but it sounds great. I love the history of it, too. Thanks Kate! I know I often take for granted where a food stuff or dish actually originated from. The ability to import and export food has definitely made the world smaller! I am mad about soup and peanuts and have never tried this before. I think it sounds brill, full of great flavours! Yay glad you like it. Let me know how it goes when you do try it. I love seeing pics too! Oooh – I’m really intrigued by this. I really want to give this a try. Peanut and limes? Definitely a great combination. What a lovely looking soup. Thank you for linking up with #SuperSoup! I love the flavours of peanut and this sounds amazing. Reminds me of some of the flavours I’ve eaten in Asia. I may be making it for supper. Thanks Luca!Let me know how it goes if you do make it!